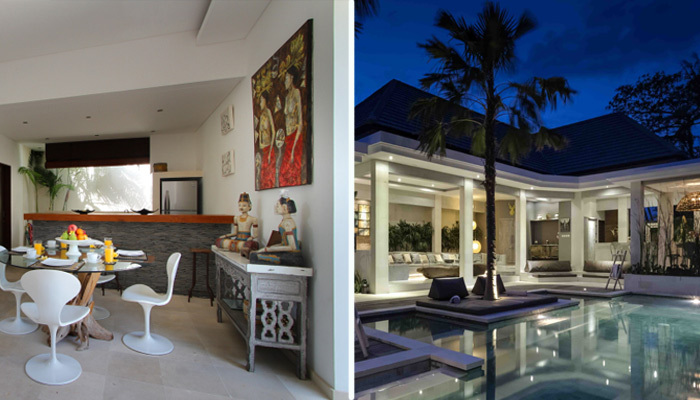 Complex Soka, composed of Villa Mana and Villa Kallayaan offers 6 bedrooms, perfect for a group holidays! This vacation rental is located in a residential area of Seminyak, the fashionable seaside resort of Bali, just minutes from the beach with its fabulous sunsets and from Oberoi street known for its restaurants, bars and boutiques. The villa is a minimalist and elegant place where modern and exotic architecture are mixed harmoniously. You will enter the villa by the living room which opens onto the tropical garden and the pool. On your left is the long bar next to the fully equipped kitchen. The villa has 2 large bedrooms and a smaller one that can accommodate two adults. They are all air-conditioned and equipped with LCD TV. The two main bedrooms have en-suite bathroom, one of them even has a beautiful terrazzo bathtub lined by exotic plants and trees where you can relax while gazing at the sky. The lush tropical garden surrounds the magnificent swimming pool where you can cool down and sunbeds are provided where you can sunbathe comfortably. You will enjoy all the modern comfort (LCD TV, cable TV, Wi-Fi etc ...) and the tranquility of the place will allow you to rejuvenate yourself in order to fully appreciate all the charms of Bali. 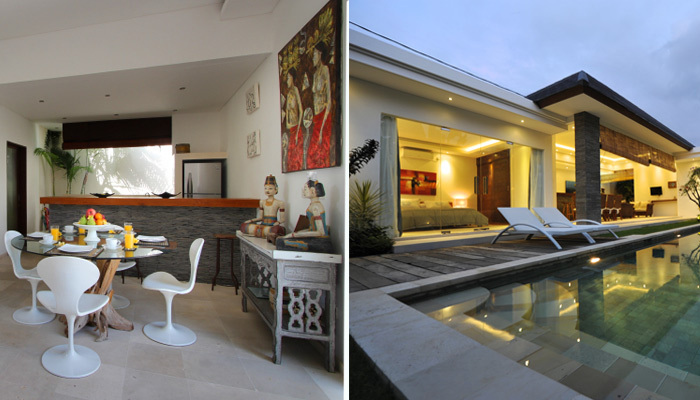 You have review for Villa complexe-soka-bali?